Tiffany 5-pc. Dining Set Put some glam into your dinner parties with the Tiffany 5-piece dining set. Impeccably glamorous, this collection takes Hollywood-inspired design and makes it dazzle. From the painted silver finish to the crystal-look tufting on the chair backs, Tiffany is an elegant showstopper. The cream-colored leather-look upholstery is oh-so stylish. Delicately carved and packed with opulence, this set also features stunning glass tabletop insets for a truly luxurious feel. Put some glam into your dinner parties with the Tiffany 5-piece dining set. Impeccably glamorous, this collection takes Hollywood-inspired design and makes it dazzle. From the painted silver finish to the crystal-look tufting on the chair backs, Tiffany is an elegant showstopper. The cream-colored leather-look upholstery is oh-so stylish. Delicately carved and packed with opulence, this set also features stunning glass tabletop insets for a truly luxurious feel. 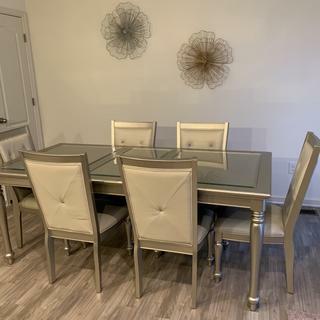 L: 60" x W: 38" x H: 30.5"
Dining chairs feature a polyurethane-foam-padded seat and back covered in durable polyurethane for a luxe finishing touch and extra comfort. I truly love my Tiffany Dining Room set. I had the best salesman in the store, Matthew, he listened to what I was looking for. He was the first to acknowledge me when I walk into Raymour Flanagan. I will definitely refer all my friends & family to Raymour as this is my second purchase !! !